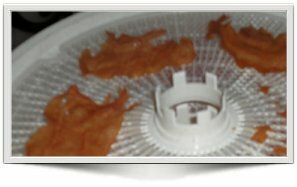 Dehydrating Beef, using Pre-Cooked, Pre-Sliced Deli Roast Beef! Today, dehydrating beef was on my dehydrating to-do list. I find it hard to slice my own roast beef (I don't have an electric slicer), so I did the next best thing, and bought the meat pre-sliced and pre-cooked! NOTE: As with leftover chicken from your Sunday Roast Dinner, you can slice up your roast beef – as evenly as possible – and make them similar in size. This way, your beef will dehydrate at the same rate of time. If you're wondering, "Where's the beef?" I'm gonna test your knowledge of where that now famous line was used in a very successful ad campaign. with our Six Simple Steps! Just like the sliced turkey, and sliced chicken, it dehydrated beautifully AND re-hydrated very well too! I used a 7 oz. plastic tub of Pre-Cooked Roast Beef from Target Stores. The Roast Beef from Target filled all four of my Nesco Dehydrator trays, with about three slices on each tray. TWO hours later, it was fully dehydrated! I Couldn't Believe Just How Easy it Was To Do! 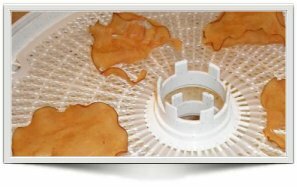 Here are some photos of the sliced roast beef on the dehydrator 'before' and 'after' dehydrating. Look at how much the roast beef slices shrank! This is normal. 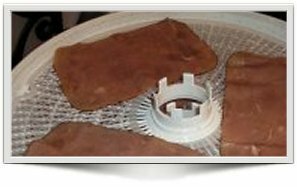 Cooked roast beef is best dehydrated at 160°F as mentioned above – but please consult your food dehydrator's owners manual for their specific instructions. Shown above is a slice of roast beef held by its corner, to show you how stiff the roast beef was after dehydrating. I then took another photo, just an hour later of the same piece of beef to show you how limp it was after re-hydrating! Re-hydrate in Beef Stock if You Wish! IMPORTANT: re-hydrate in the refrigerator in CLEAN water. Don't leave it out on the counter top and let the expensive roast beef go bad! If you want to re-hydrate your beef in beef stock (imagine that!) then here's a link to the site called Better Than Bouillon. c) Wendy's, way back in 1984! Read more here on Wiki!